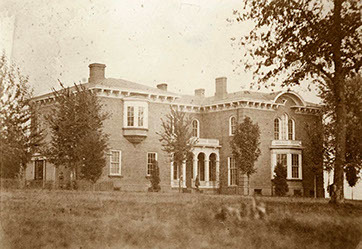 Linwood Lawn, originally known as Limrick Lawn, was built by William Limrick, a prominent Lexington banker for his wife Rebecca. When asked why he chose to build such a large and grand mansion, William simply responded: “Rebecca always wanted a nice home, so I tried to build her the finest one that I could”. Today this stately and majestic home is regarded as the finest antebellum mansion in the Midwest. Following a loving three-year restoration, Linwood Lawn was reopened to the public in late 2015. 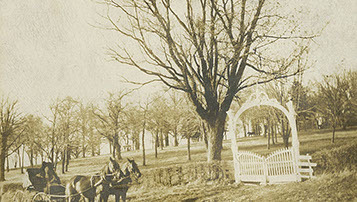 Linwood Lawn was constructed between the years 1857 and 1859, at a cost of $85,000. It was said to be the first house west of the Mississippi to have a centralized heating and cooling system and hot and cold running water. Amazingly the mansion is virtually intact, and it features the original imported Italian fireplace mantels, sterling silver doorknobs, intricate ceiling plasterwork, hand carved mahogany stair case and newel post, and the original Cornelius and Baker chandeliers. William Limrick was born in 1812, in New York. His family moved west, and he grew up in the river town of Shawneetown, Illinois. In 1839 he relocated to Lexington. At the time Lexington was a bustling city known for supplying merchandise for both western exploration and the Santa Fe Trail trade. Mr. Limrick opened a mercantile business soon after arriving here, but within a few years he became a banker. His bank building still stands at 8th and Main in downtown Lexington. In 1842 William married his lovely bride Rebecca. Mr. & Mrs. Limrick raised a family of five: Anne, Ella, John, May and, Nina. 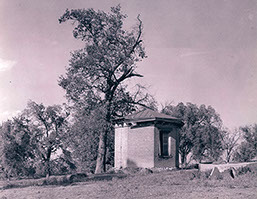 Nina was born in the mansion in November of 1861. It was said that throughout the 1840’s and 1850’s Mr Limrick was very successful in business. He said that in the years leading up to the war he was making $30,000 per year, which would be an income of around $1.5 million in today’s dollars. Leading up to the Civil War, Mr. Limrick was a staunch and vocal Southern sympathizer. His political views resulted in his arrest in March of 1862, and ultimately, he was banished from Missouri throughout the rest of the War years for “disloyalty to the Union”. William spent the years in exile living in New York City and working at the New York Stock Exchange, where he was known as a successful gold speculator. At the end of the war he was allowed to return home, and he reopened his bank in 1866. Although the impacts of the war and its tumultuous aftermath never allowed him to regain his previous level of prosperity, he did operate his banking house until he retired in 1879. 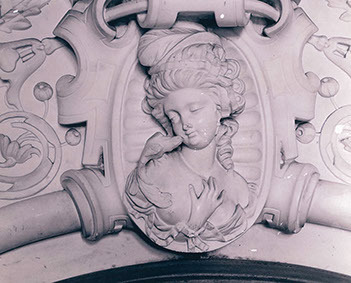 After Rebecca suffered from an unknown illness in the last years of her life, and passed away in April of 1877. William almost immediately began an effort to part with his country estate, selling the 320 acre property including the mansion and all improvements for $14,500, a huge loss. Over the succeeding years the property changed hands many times and its condition began to deteriorate. The main problem was that the original roof was in place and began to leak, causing water damage. 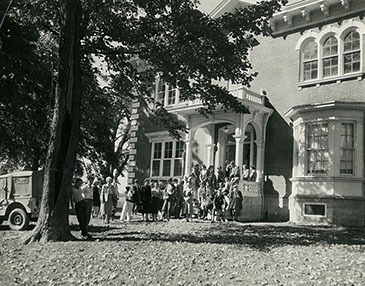 From the 1940's into the 1980's, only the five rooms on the east and north side of the first floor were occupied. 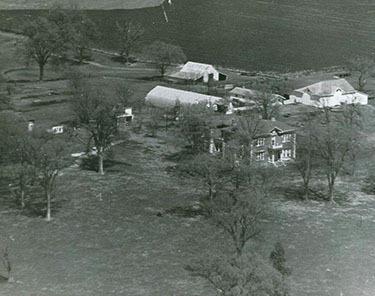 In the 1980's the mansion and ten acres were sold again and initial efforts to save the mansion were undertaken by the new owners. Finally in 2012 the current owners began a complete restoration of the entire mansion, and today Linwood Lawn is once again as beautiful as it was in 1859.